New to parenthood, I was and I am still worried about the best diapers to choose for my kid. Apart from the fit and size, what matters is the product quality, its softness and the overall capacity to soak all the excess and yet keep it dry in the inside. 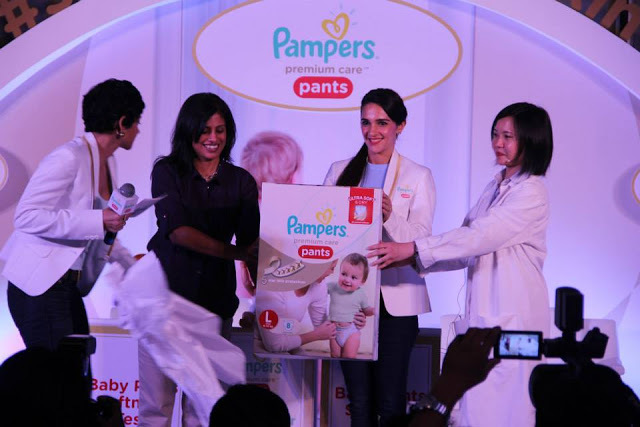 I consider myself lucky enough to witness the product launch of Pampers Premium Care Pants. 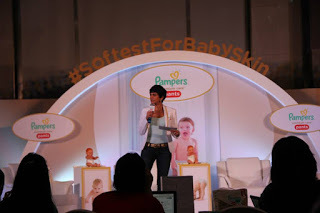 With lots of questions in my mind, I was pretty much intrigued as the launch was described as ‘Softest For Baby Skin’. Moreover, I have never used pants as a diaper. So I was all the more excited to know more about the #SoftestForBabySkin product first-hand and in detail. The event was held at J W Marriott, Sahar, on 20th of September. The entrance and the stage were nicely decorated with set with pictures and play cards of babies all around. It was a nice little cozy environment filled with plenty of moms and few dads who were very much keen on discovering what was planned for the next couple of hours. As I took my seat, I saw three vertical boxes placed one upon another, labelled as 1, 2 and 3 respectively. Also on the table, were remotes, note pads to scribble. tissues and water bottles. The boxes and the remote kept us guessing and built the surprise element extremely well. Finally, with light, camera and action, actress Mandira Bedi arrived on stage as the host for the afternoon. She was all smiles and glamorous in her look, as she took us through some of her experiences with respect to parenting and choosing a good diaper. She gave a brief history of Pampers and how it is associated with child care. To talk more about parenting, especially in the child’s early stage, and the importance of choosing a good diaper, she introduced to us a panel of three experts. 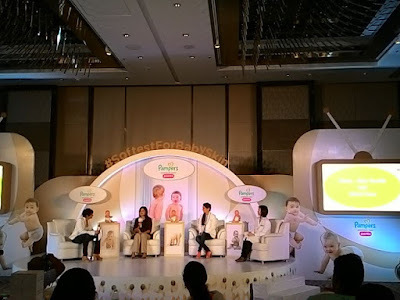 Actress and celebrated mother, Tara Sharma, Ajita Seethepalli, a child sleep consultant and Dr. Wei Sing Long, an R&D expert from Pampers were on stage to talk more on the subject. They started talking about motherhood and shared their personal experiences of raising their own child and the troubles that they faced while selecting a perfect diaper for their respective kids. They talked about the importance of a diaper as compared to the cloth ones and I was almost nodding in agreement to their discussion. Being used a cloth diaper during the initial period on my child, because of the so called tradition that has been going on since centuries, I was now very upbeat about the new product from Pampers. Furthermore, Dr. Wei Sing Long talked about the importance of a soft baby skin in an infant baby and how vital it is to maintain that softness of the baby skin. Starting right from the birth to the early stages, it is important to provide the child with total comfort and care when it comes to skin. So to check, if the parents understand what softness mean, we were first asked to open the slits of the three boxes placed on the tables. Then, without viewing the product placed in the boxes, we had to simply feel the product and use the remote to vote for the box that contained the softest product that we felt. We had no idea where the Pampers diaper was kept and almost majority of us voted for the box 2. No prizes for guessing that it was Pampers. 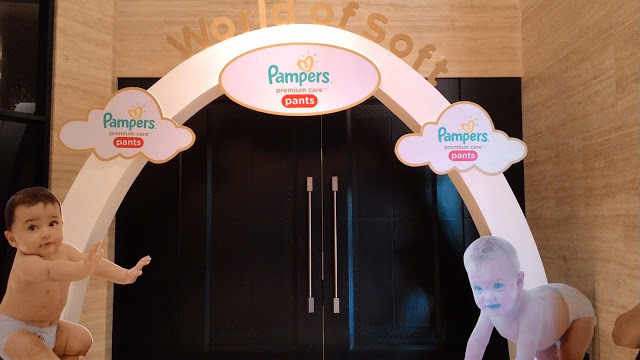 Finally, the product New Pampers Premium Care Pants was launched by the panelists which is touted to be ‘as soft as mom’s touch’. This new Pampers Pants have a super soft waist band that sits on the waist comfortably without leaving any rashes along with superior wetness soaking capabilities to provide dryness from the inside.